Hidden galaxy discovered next door — While inspecting a known globular cluster, a team of astronomers began to notice that some of its stars didn’t seem to belong. Investigating further, they realised the anomalous stars were part of a nearby galaxy previously unknown to us. ~ OK, it’s a previously unknown dwarf spheroidal galaxy. Mars could support wells — A science paper available for download [pdf] cites evidence from about two dozen deep impact craters located from the equator to 37 degrees north latitude that Mars has a ground ice table at an elevation that also corresponds to other shoreline features. This suggests a deep groundwater water table (as ice), though it would be almost entirely underground. ~ Bet that tastes just delicious. Light-based 3D printer — A research team from the University of California, Berkeley, and Lawrence Livermore National Laboratory has created a printer that shines light onto specific spots in a rotating resin which solidifies when exposed to a certain light level. This forms the entire item all in one go, rather that forming items by laying down one layer of material at a time, like most 3D printers. ~ Prints take from from 30 seconds to a few minutes, compared to hours. Hydrogel gets stronger under stress — A research group in Japan has found a method to develop stronger, longer-lasting materials using a strategy inspired by the process responsible for muscle growth. The team led by Professor Gong Jian Ping of Hokkaido University, Japan, developed what they call double-network hydrogels made from 85% water and two types of polymer networks—one rigid and brittle, the other soft and stretchable, mimicking the way muscle strengthens as it’s worked. ~ So beware when future robots start working out. Online service predicts kidney stones — A calculator devised by researchers called the Recurrence Of Kidney Stone (ROKS) model was originally developed and released to the public by the Mayo Clinic in 2014, as both an online tool and smartphone app. But the original version could only predict someone’s likelihood of getting a second stone following their first episode. Now the researchers have detailed the creation of an upgraded ROKS capable of predicting later episodes that need medical care no matter how many stones someone has already had. A modern five-day forecast is as accurate as a one-day forecast was in 1980 — Over the past few decades, scientists have gotten significantly, even staggeringly, better at predicting the weather. Modern 72-hour predictions of hurricane tracks are more accurate than 24-hour forecasts were 40 years ago. Body heat power — Researchers from the University of Massachusetts, Amherst, have developed a new method of harvesting electricity from body heat to power wearable devices. 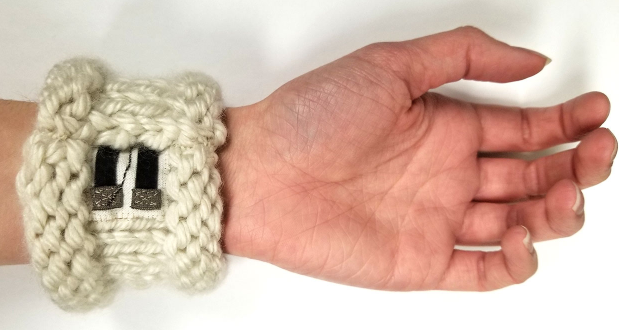 The new, wearable thermoelectric generator is sourced from non-toxic and non-allergenic substances, making it a viable candidate for wearable technology. The substrate on which the generator is built is plain old cotton fabric. ~ Well, pants to that. Dinosaur feather — Using advanced imaging technology, scientists have shown that a fossilised feather uncovered in the 19th century likely didn’t belong to the bird-like Archaeopteryx as conventionally believed. The 150-million-year-old fossilized feather was uncovered in 1861 within Late Jurassic limestones from the Solnhofen area of southern Germany. The diversity of bird-like Jurassic dinosaurs is likely greater than we’ve appreciated, and there are likely more fossils of unknown species still waiting to be discovered. ~ Probably will cause quite a flap, then.